“Red Hill Mining Town” was remixed with new vocals for the 2017 re-release of The Joshua Tree (It can be found on the box sets only, and will not be on the two disc version). The song features new vocals from Bono and the Edge, recorded recently, mixed with older vocals from 1987 from the original song. The chorus appears to use the vocal from 1987, while the verses are new. The lyrics are very similar to the original but the ending is different, bringing in additional backing vocals by The Edge. 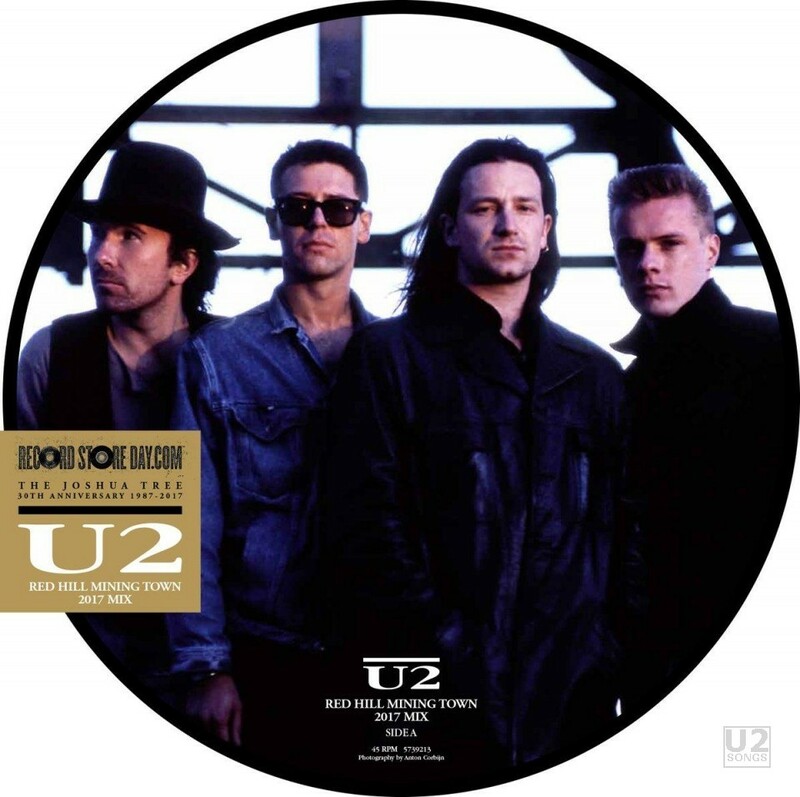 To coincide with the 30th anniversary of U2’s iconic album The Joshua Tree, Island Records will release a 2017 mix of ‘Red Hill Mining Town’ on limited edition 12” picture disc, featuring the classic photography of Anton Corbijn in colour. The previously unreleased mix is by Steve Lillywhite, who produced the band’s critically acclaimed debut, ‘Boy’. ‘Red Hill Mining Town’ is famously “the single that never was”, originally discussed as the second single from The Joshua Tree but then put to one side at the last minute in favour of ‘I Still Haven’t Found What I’m Looking For’. The Joshua Tree went to #1 in the U.K, U.S., Ireland and around the world, selling in excess of 25 million albums, and catapulted Bono, The Edge, Adam Clayton and Larry Mullen Jr “… from heroes to superstars” (Rolling Stone). The 12-Inch picture disc was released on April 22, 2017 for Record Store Day 2017. This release was limited to 7000 copies. The front of the clear vinyl sleeve is stickered to read “RecordStoreDay.Com, The Joshua Tree, 30th Anniversary 1987-2017, U2, Red Hill Mining Town, 2017 Mix”. The vinyl will be limited to 7000 copies. The vinyl did not contain a digital download, nor was the vinyl numbered. In a surprise move, Universal did distribute 1500 copies of a numbered booklet with instructions for these to be given out with the release. 500 copies of this booklet were distributed in Europe, and 1000 copies were distributed in North America. There were slight differences in the booklet distributed in each region. The track became available on streaming services and for digital download on April 21, 2017. It was sold as a standalone single on several storefronts including 7digital, Google Play, and Tidal. Other vendors including iTunes and Amazon sold it as a pre-release album cut for the Joshua Tree 30th anniversary release. In both cases, the album art was the same as that used for the Joshua Tree 2017 Super Deluxe Edition. The digital file is 4:53.243 in length. The song will later be available digitally and on CD and vinyl through the release of The Joshua Tree box sets on June 2, 2017. The song was first heard as part of a video showing the vinyl being pressed on March 21, 2017. That clip of the song was just over a minute in length. The full length clip was first played on RTE Radio 2 FM on the Dave Fanning Show on Sunday, April 16, 2017. Steve Lillywhite will be a guest on the Dave Fanning Show on Saturday, April 22, (Record Store Day) discussing this new version of the song. Produced by Daniel Lanois and Brian Eno. Recorded by Flood. Mastered by Scott Sedillo at Bernie Grundman Mastering in Hollywood. The Arklow Silver Band was arranged and conducted by Paul Barrett. Photography by Anton Corbijn. Design by Shaughn McGrath, AMP Visual.